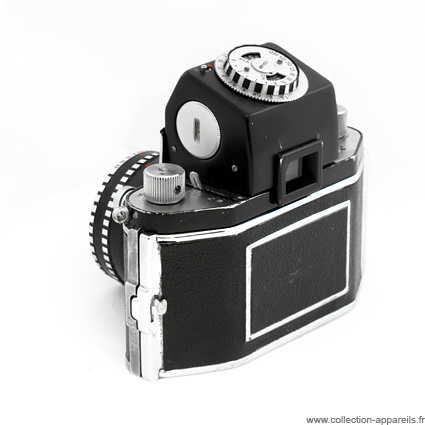 Manufactured in Allemagne (ex-RDA) from 1956 until 0. 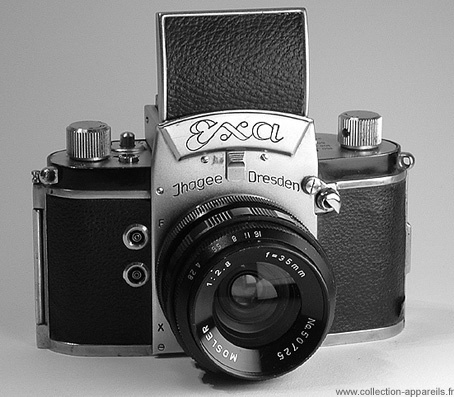 The series of Exa reflex camera using this type of body and recognizable to this pediment curved and marked Exa (and not Exakta as on certain former models) was manufactured 1951 to 1960. 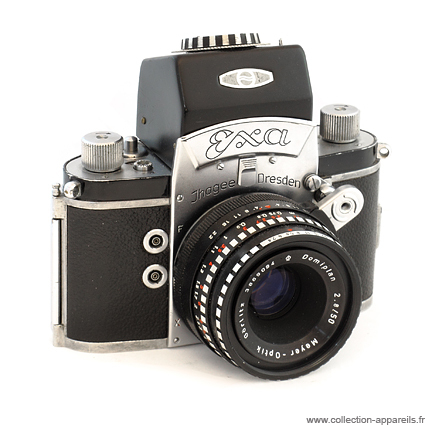 This model is distinguished from the precedents by the two pins for flash chrome and indicated F and X, and either M and X. One of the characteristics of Exa is the not very conventional gear shift lever! Notice the absence of reverse gear however. 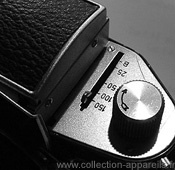 The Examat prismatic light meter shown on pictures further down, reached the market in 1968. It was not produced by Ihagee successors, i.e. the industrial Kombinat VEB Pentacon of GDR/DDR, but by Harwix in West Berlin. During a recent visit paid to the Technical Museum in Dresden, located in the old Ernemann factory building, we learned that this light meter was indeed conceived and designed by the Exakta team, but that Harwix was entrusted with its development and production as well as its consecutive marketing. A nice illustration of what was happening at the time of the cold war ! Practically however, most of those cells were eventually used on Exakta or Exa bodies, even if they could be fitted on some other cameras as well. In Western Europe, the same importers who were importing Exakta products from GDR were also importing the Examat. This prismatic light meter is not small (it weights 155 grams without battery). It contains a pentaprism on which the light is measured on the fly. Its range is 6 to 1600 iso as well as an aperture/speed combination from 1.4 to 22 and from 8 seconds to 1/1000. It requires a PX625 battery (1,35V). A small needle visible on the left in viewer indicates if the exact exposure parameters are selected. This Examat prismatic cell was probably sold more commonly together with (or for) an Exakta than together with (or for) an Exa, as the latter had much more modest an exposure range.